Mr. Akihiko Fujii, Consul-General of Japan in Chiang Mai, and Ms. Jeeranun Mongkondee, Regional Director for Thailand and Vietnam, PH-Japan, jointly signed the funding contract for “The Project for Youth HIV/AIDS Education in Chiang Mai”. The Government of Japan, under its Grant Assistance for Japanese NGO Projects, is providing funds for “The Project for Youth HIV/AIDS Education in Chiang Mai” conducted by a Japanese NGO, PH-Japan. 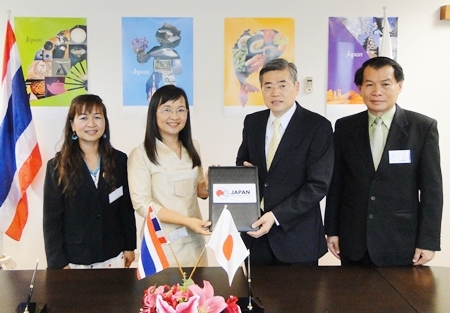 On July 31, 2013, Mr. Akihiko Fujii, Consul-General of Japan in Chiang Mai, and Ms. Jeeranun Mongkondee, Regional Director for Thailand and Vietnam, PH-Japan, jointly signed the funding contract for the Project at the Consulate-General of Japan in Chiang Mai. Thailand has been effective in preventing the transmission of HIV on a national scale. However teenagers now in Thailand are among the most likely generation to be affected by HIV infection. It is suggested that the major reasons for HIV infection today include declining HIV/AID knowledge, an increase in multiple partners, and inconsistent condom use. The youths have confused views on how to protect themselves from HIV. PH-Japan has conducted a project for HIV/AIDS prevention for university students since 2002. Based on this experience, PH-Japan will start a Project targeting youths in Chiang Mai Province with preventative HIV/AIDS education in cooperation with the Chiang Mai Provincial Public Health Office and School Officials. In response to a request from PH-Japan, the Government of Japan has decided to provide funds amounting to 4,054,100 baht for the first phase of the Project. The funds will be used to procure educational equipment, to arrange learning for youths, and to arrange seminars for youths and school officials on HIV/AIDS prevention. It is expected that youth HIV/AIDS prevention education will provide clear and accurate information regarding HIV/AIDS that is relevant and meaningful to youths, and more youths will obtain knowledge about HIV/AIDS properly in order to reduce their HIV infection risks. For more information, please contact Mr. Sato, Consul, Mr.Inoue, Staff Consulate-General of Japan in Chiang Mai. 053-203-367 / Facsimile: 053-203-373. The weather bureau has warned that an approaching tropical storm will bring more heavy rains to most parts of the kingdom. The Meteorological Department reported that tropical storm Jebi is being formed 700 kilometers off the southern coast of China, maintaining a wind speed of 65 kilometers per hour. The storm is forecasted to make landfall in the upper parts of Vietnam during August 2-3 before proceeding to cover Laos. Thailand’s North, Northeast, Central Plains and East will see more torrential rain this weekend due to the storm. The Chiang Mai bound special express train derailed in the early morning hours of Saturday, August 03, 2013 in a tunnel in Uttaradit province. 415 passengers were on the train but no injuries were reported. The station master said that the train derailed in a 382 meter long tunnel between the station at Ban Pang Ton Phueng in the Muang district of Uttaradit and Huay Rai station in the Den Chai district in Phrae. The passengers were delivered to their destination by 30 buses. This is the second derailment in less than two weeks on the Northern route, the last one saw several people seriously injured when a train derailed on a curve on July 17. The Public Health Ministry is fighting a sharp upsurge in dengue fever as the disease has killed nearly 80 people from across the country. So far this year, 81,763 dengue fever cases have been recorded in Thailand, with the highest concentration of cases in the northern province of Chiang Mai. During the past week, the province saw 6,284 people infected by the virus. The ministry is launching a strict campaign to eradicate the mosquitoes’ breeding grounds and to urge residents to seek medical treatment as soon as they display symptoms. War rooms have been set up to coordinate campaign work with provincial health offices. The Northern office of Disaster Prevention and Mitigation has issued a warning for people in the North and North East that heavy rains will be hitting through the rest of the week. People living near hills and waterways are urged to take extra caution and prepare for possible flash floods from forest runoff due to heavy rains in the next few days. Chiang Mai, Mae Hong Son, Chiang Rai, Lampang, Lamphun, Tak, Phrae, Phayao, Nan, and Loei in the North as well as Sakhon Nakhon, Mukdahan, Nong Khai, Buengkhan, Nakhom Phanom, Udon Thani, and Nong Bua Lamphu. Tak has already been hit but heavy rains and flash floods with the market at Rim-Moei submerged under 50 cm of water forcing vendors to evacuate. The Moei River has overflown its banks in the heaviest rains seen in a decade. There is a national hotline for people needing assistance for those affected by heavy rains: 1784. Three men have been arrested in Chiang Mai Province with 100,000 pills of methamphetamine while they were trying to smuggle the drugs into Bangkok and its vicinity. Drug suppression police arrested 3 men in front of a school in Mae Ai District of Chiang Mai. These men were caught smuggling 100,000 methamphetamine pills. After a quick interrogation, one of the smugglers named Somchai Somjai, 25, confessed that he was acting as a delivery man who would pick up the drugs in the border area and deliver them to the other 2 men who were waiting in Mae Ai District, where all the 3 men were nabbed. Japanese Consul General presents the symbolic key to a new ambulance for Om Koi Hospital. The Government of Japan, under its Grant Assistance for Grassroots Human Security Projects Scheme (GGP), has provided funds amounting to 1,823,000 baht for “The Project for the Improvement of Medical Referral Systems in Mountainous Areas in Omkoi District, Chiang Mai Province”. On July 2, 2013, Mr. Akihiko Fujii, Consul-General of Japan in Chiang Mai, and Dr.Prajin Laothiang, Director of Omkoi Hospital, were present at the handover ceremony of an ambulance at Omkoi Hospital. Omkoi district is in a mountainous area. Minorities such as the Karen, Hmong and Lahu form the majority of its population, and their villages are scattered among mountains and valleys over wide areas. They live in a hard environment on poor hilly farmland, with no electricity, no telephone, no water supply, no toilet, intense heat in the summer and temperatures below 5 degrees in the winter. As a result, people survive in extreme poverty and suffer from chronic malnutrition, diarrhea, food poisoning, parasitic diseases and malaria. Unfavorable geographical conditions and poor maintenance mean that many roads in these steep mountainous areas are muddy or blocked in the rainy season, impeding access to health care. It is impossible for many to receive adequate medical services. Omkoi hospital, which is the only government hospital in the district, covers 62,000 residents of 95 villages in 6 sub-districts and 243 settlements, and treats about 76,000 cases a year. Moreover, it provides humanitarian treatment regardless of the expense, because there are many stateless people. Indeed, for people living in such remote areas, it is not easy to access health and medical services. In order that more people can access the services, Omkoi hospital has provided regular mobile clinic services which include dentistry and prenatal checkups, targeting remote and mountainous villages. Moreover, the hospital also conducts referral services between village and hospital for people who cannot travel due to geographic and economic conditions. However, because there was no four wheel drive ambulance, only a pickup truck which had neither bed nor life support equipment could be used to transport patients. Therefore, many patients lost vital time in receiving medical treatment. In response to a request from Omkoi hospital, the Government of Japan provided funds for a four wheel drive ambulance with life support equipment for Omkoi hospital. Now Omkoi hospital is prepared to receive more patients by the construction of a new building which expands the inpatients' ward capacity from 30 to 60 beds. Meanwhile, more lives of local residents will be saved by the provision of an ambulance at the same time. In Northern Thailand, the Government of Japan has supported a number of medical institutions tackling health and medical problems in mountainous areas. It is expected that this assistance for Omkoi hospital will strengthen the emergency transport system and health services in Omkoi district and neighboring areas, helping the health and medical services to reach all and reducing the regional disparity. The Wangkanai Group sponsored the “Read Me” project that was held on June 15 and 16 at Kad Suan Kaew’s car park which saw street artists join in painting the walls to promote reading and books. Thanyarak Na Wangkanai, PR Director of the Wangkanai Group said that they had made a book “Read Me Chapter; Little things as sugar grains” to distribute and are also collecting books until the end of October to donate to the needy. The head of Chiang Mai Street Artists PIchai Boonkumyu said that the project would promote reading and the love of books through the use of art. The Mayor and city officials checked the brightness of LED billboards and asked vendors to cooperate in dimming them at night after receiving complaints from locals. Mayor Tussanai Buranupakorn and city officials checked LED billboards around Chiang Mai city on July 24, 2013 at 8 p.m. after complaints from locals citing the distracting brightness of the lights at night and fears of accidents. The Mayor noted that while there are no laws governing these new kinds of billboards he would ask the billboard companies to cooperate in dimming the lights at night for public safety. The companies agreed to dim the lights from 20% to 40-50% but if there are still effects and complaints the municipality will request that they are dimmed further. The owners of the LED billboards said that they will restart the billboards in the morning as the automatic restart sets them to fully bright again, they will also dim the lights and increase the intensity of the background colors in order to reduce the distracting brightness of the LED billboards that are increasingly popping up all over town. Sai Sai, 29, works in a fish-canning factory in Mahachai, just south of the Thai capital Bangkok. With the help of a broker, he crossed the border from Myanmar illegally five years ago. Now as the August deadline to register illegal workers looms he is using the same broker again, paying US$400, or nearly two month’s salary, to get legal. “Compared with some of my friends, the cost of getting legalised here was quite expensive for me. Some of my friends paid only $160,” he says. Sai Sai is one of the millions of illegal workers in Thailand, mainly employed in low-paying jobs in the construction, fishing and service industries. They’re vulnerable to exploitation, not just from their employers, but also from brokers. The Thai government has been encouraging illegal migrant workers to legalize themselves, but the registration process is time consuming and troublesome. This is where the brokers come in, says Max Tunon from the International Labour Organisation in Bangkok. “Employers and workers can choose to use a broker and indeed there are a number of brokers – an industry of brokerage has sprung up around the regularisation of migrant workers,” explains Tunon. A broker can charge between 10,000 and 20,000 ($318-$636) baht for facilitating the process, even though the actual cost is $160. Without legal documents, illegal workers are left with no other options but to pay the agents, making them vulnerable to exploitation. “The concern that we have is that there is no regulation of these brokers, there is no oversight from the Ministry of Labour or the Department of Employment,” says the ILO’s Max Tunon. The ILO is campaigning for tighter regulation of the registration process and Tunon says there are signs that the Thai government will change the law. After the deadline, migrant workers who haven’t registered and employers who hire them will be arrested and heavily fined. But the legal work permit doesn’t actually change the working conditions for migrant workers. Sai Sai says he’s still treated as a second-class citizen. “I feel better now I've got the documents, but the working conditions are still not great,” he says, “We're supposed to get 30-minute breaks but often we work a 12-hour shift non-stop,” he says. Sai Sai says there's also discrimination between the Thai workers and the migrant workers. If Thai workers fall sleep on the job, no one complains, he says. With an August deadline looming, migrant registration centres have been swamped. 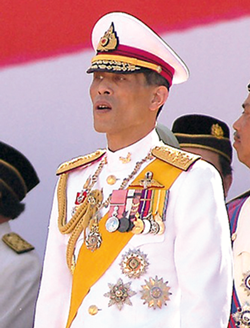 In the meantime, Thailand's illegal workers must stay out of sight to avoid arrest. This article was first broadcast on Asia Calling, a regional current affairs radio program produced by Indonesia’s independent radio news agency KBR68H and broadcast in local languages in 10 countries across Asia. It is published in conjunction with the Faculty of Mass Communications, Chiang Mai University. You can find more stories from Asia Calling at www.portalkbr.com/asiacalling. As the number of dengue fever patients continues to climb potential breeding grounds of mosquitoes must be eliminated. Local “mosquito expert” Mark Isenstadt recently surveyed a local school to determine why it had a serious infestation of mosquitoes and uncovered major issues of standing water and blocked drains despite the city’s calls to ensure that all potential breeding grounds be removed. Piles of discarded desks and chairs with puddles of water at the bottom, blocked drains, fountains and small pools that had not been cleaned and did not have any fish to eat the mosquito larvae and the ever present potted plants with water in the bottom breeding mosquito larvae. Using mosquito trapping equipment to analyze the mosquitoes, Mark, of Vector Collector, reported that the mosquitoes there were of the Aedes variety and that the school, like many other areas of Chiang Mai, had reported cases of dengue. Mr. Isenstadt submitted his report to Mayor Tussanai Buranupakorn regarding Wat Sri Don Chai School and the Mayor called a meeting with heads of schools to pass the report and Mark’s recommendations on. Mark urged the city to have all schools checked and cleaned up, all debris removed, potted plants cleaned every 48 hours and any pools or ponds to be stocked with small fish to eat mosquito larvae or to be emptied completely regularly. One of the things that Mark has stressed to everyone is that any potential pool of water, no matter how small must be eliminated. He noted that even a tin can or plastic bag lying on the ground collecting rain water can become a source of mosquito larvae. 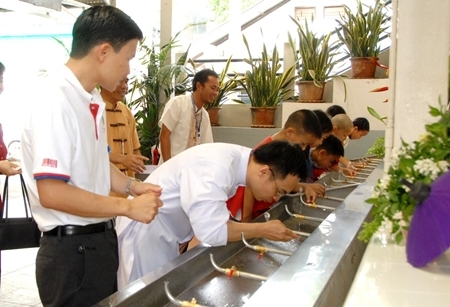 The Chiang Mai Municipality set in motion a plan to check the quality of drinking water in 26 municipal schools as well as check the cleanliness of drinking fountains in schools to promote students’ health. The health department will check for bacterial contamination, lead and coliform bacteria in water and advice schools on proper locations of water fountains. The operation began at Montfort College Primary School on July 19, 2013. Chiang Mai Governor Tanin Subhasaen announced the opening of the Emergency Center for this year’s rainy season noting that the Thai Meteorological Department was forecasting heavy rains across widespread areas of the North through September with the rainy season expected to taper off by mid – October. Chiang Mai Governor Tanin Subhasaen announced the opening of the Emergency Operations Center for this year’s rainy season. The Emergency Operations Center for Floods, Storms and Landslides was set up at City Hall to work to prevent problems and to implement any reconstruction and support to those areas that may be hit. The Center works to coordinate the various governmental organizations so as to minimize suffering and reduce the impact should disaster strike. Mayor Tussanai Buranupakorn meets with investigators and sprayers to check infested areas. 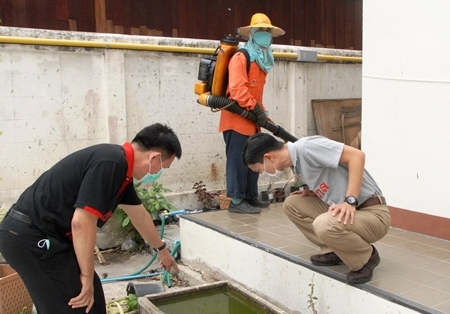 The Chiang Mai Municipality has sent out mobile units to spray against mosquitoes after Mayor Tussanai Buranupakorn announced that the city has had more than 600 confirmed cases of dengue fever, around the province the number has reached over 4,000 patients. The city has set up a Complaint Center that people can report to about areas that are at high risk of dengue, the Complaint Center will send out an investigator to check the area. The city has called on people to help in combat dengue fever in the city by making sure there are no containers holding standing water and to change water in containers every 7 days. People are asked to report dengue fever patients to a public health volunteer or call the Department of Disease Control and Prevention. 053-259-134. Members of Chiang Mai Creative City and the British Council join their two speakers onstage of Centara Duangtawan Hotel for the seminar on British and European markets for local crafts. The Arts & Crafts International Center of Thailand (Public Organization) in cooperation with Handmade Chiang Mai, a Chiang Mai Creative City project with the British Council, held a seminar on ways for Thai and Myanmar craft entrepreneurs to enter U.K. and western markets. The seminar, held at the Centara Duangtawan Hotel Chiang Mai on July 18 -19, 2013, saw speakers share points of view and suggest ways in dealing with British and western markets for area entrepreneurs. Ms. Helen Johannesen of the Collect Craft Council in London and Ms. Catherine Lock of The New Craftsmen joined Phiyhanun Mahanupap, President of the Northern Handicrafts Manufacturers and Exporters Assocation (NOHMEX). The seminar focused on marketing, social media techniques, increasing product value and product selection for the European markets. More information can be found on the website of Arts and Crafts International Center of Thailand (Public Organization) www.sacict.net and www.handmade-chiangmai.com. Arreerat Tiemthong, Director of the Chiang Mai Women’s Correctional Institution and Pattaraporn Wongpakham of the Kandara Spa Chiang Mai signed the agreement to provide training and employment to released prisoners on July 17, 2013 at Kandara Spa. Kandara Spa Chiang Mai, located on Soi 17 Nimmanhaemin Road, signed a Memorandum of Understanding with the Chiang Mai Women’s Correctional Institute to develop the massage and spa skills of released women prisoners. The goal is to provide the women with the means to obtain gainful employment after release and become contributing members of society. Arreerat Tiemthong, Director of the Chiang Mai Women’s Correctional Institution and Pattaraporn Wongpakham of the Kandara Spa Chiang Mai signed the agreement on July 17, 2013 at Kandara Spa. The Chiang Mai Women’s Correctional Institution will prepare the training facilities, accommodate the speakers, and choose qualifying prisoners to attend training. They will then send their information to Kandara Spa, track the work of the released prisoners and help support the budget. Kandara Spa will manage the training and guidance of Thai massage and spa skills, employ prisoners to work and cooperate with the Women’s Correctional Institution to track the work of the released prisoners. 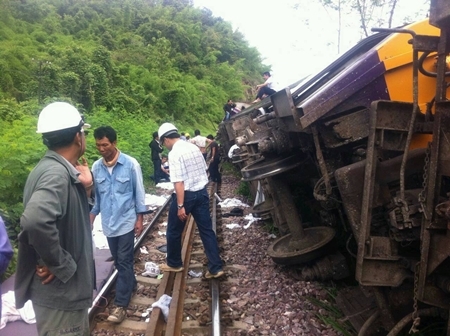 The Chiang Mai bound express train derailed in Phrae province on July 17, injuring 30 passengers, mostly foreigners. A Chiang Mai bound train derailed between Pakpan station and Ba Keang Luang station in Phrae province injuring 30 passengers, 5 of them severely. 10 cars came off the tracks at 3:55 a.m. on July 17, 2013, flipping over onto their sides in the accident which took place at a bend in the tracks where the wooden sleepers are being replaced by concrete ones. Transport Minister Chadchat Sittipunt said that deteriorated track and poor weather conditions may have been the cause of the derailment noting that the speed limit at that particular spot was 45 km per hour, the train was reported to be traveling at 40 km per hour at the time of the derailment. The train was carrying 290 passengers at the time and most of the injured were foreigners. The remaining passengers were picked up and transferred by bus to Chiang Mai. Travel resumed on the Bangkok – Chiang Mai route after the tracks were cleared and repaired and service is now running normally. Monorail system for Chiang Mai?